As a contractor, getting a mortgage can be challenging. Banks and lenders may not take a holistic view of your income or accurately assess affordability based on your total earnings. As a result, you could end up with a loan that doesn’t reflect your true borrowing potential; with an interest rate that penalises you just for being a contractor. 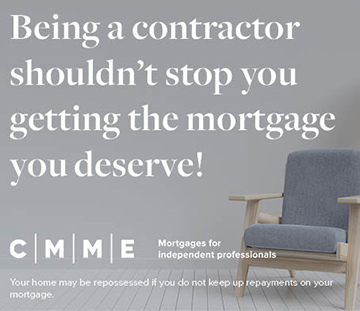 At Contractor UK, we’re committed to providing the best possible products & services for our members and that is why we have teamed up with CMME; one of the UK’s leading mortgage specialists for contractors, freelancers, and business owners. So, whether you’re interested in buying a new home, remortgage, second charge mortgage or a buy-to-let property CMME can help. Having helped thousands of independent professionals obtain the mortgage funding they require, CMME are ready and able to help you finance your new home or property. Simply fill in the form below to get the process started, or visit the CMME website. Check out the mortgage deals of the week here. CMME’s experienced advisers answer some of the most frequestly asked questions on mortgages for contractors. If you need more information check out this handy five step guide to help you get through the process of getting a contractor mortgage. Work out how much your monthly payments and total cost of the loan would be on both a repayment and interest only contractor mortgage. There are many perks to working as a contractor, not least being able to take breaks between contracts should you wish to. This is great for holidays or similar. However, you should try and avoid taking breaks of anything more than 6-8 weeks. This is because lenders want to see consistent income and contracts stretching back 12-24 months prior to your mortgage application – long gaps between receiving income payments are not viewed favourably.